In cancer treatment, oncologists often use certain compounds to make chemotherapy drugs more effective against malignant cells. These compounds are said to increase the cytotoxicity of the medication. Researchers have identified several of these compounds for various mesothelioma drugs. These include the COX-2 inhibitor, which makes pemetrexed more effective, and HMBA, which increases the potency of doxorubicin. An article in the December 2012 issue of the Journal of Thoracic Oncology discussed another such compound, known as E1B-ff kD-defective adenovirus. In laboratory tests, this genetically altered adenovirus produced encouraging anti-tumor effects with both cisplatin and pemetrexed. Animal studies also recorded positive results in subjects who received the altered adenovirus/cisplatin combination. In its original form, the adenovirus can cause respiratory illnesses such as conjunctivitis and tonsillitis. Without the E1B-ff kD gene, however, the virus is not able to trigger these diseases. The E1B-ff kD-defective adenovirus is a type of oncolytic virus. In layman’s terms, this means that it is a virus that researchers have specifically engineered to play a role in cancer treatment. The E1B-ff kD-deficient version of the adenovirus is also referred to as Ad-delE1B55. Oncology researchers have focused on the adenovirus for more than a decade. This virus can selectively infect and reproduce in tumor cells, making it an ideal agent for gene therapy. This type of therapy treats mesothelioma by replacing genes that became defective during the development of the cancer. Because mutated genes can allow cancerous cells to grow uncontrollably, gene therapy focuses on replacing the damaged genes with a healthy copy. 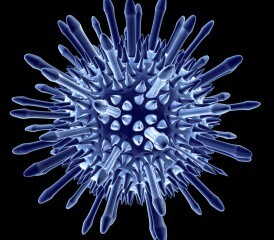 Viruses  such as the adenovirus  are their preferred method of manipulating their target genes. Most medical professionals regard gene therapy as less toxic to healthy cells than chemotherapy. However, when used in combination with chemotherapy, gene therapy may provide even more promising results. When used with first-line mesothelioma chemotherapy, researchers believe the E1B-ff kD-defective adenovirus may be a potential therapeutic method for treating mesothelioma. The study found that the E1b-ff kD-defective adenovirus was able to activate the p53 tumor suppressor gene. This gene is commonly mutated in mesothelioma patients, and some versions of the gene are associated with a higher risk of cancer susceptibility. Mesothelioma cells that were infected with the altered adenovirus also displayed higher-than-normal chromosome levels. Cells that have these elevated chromosome levels (a condition known as hyperploidy) are especially susceptible to immune responses.